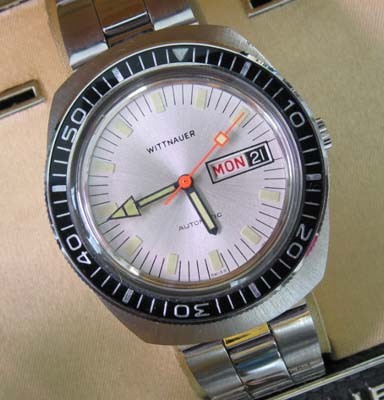 A new old stock Wittnauer Nautilus. This gem was found on a local dealer shelf after being refreshed for sale, never sold. 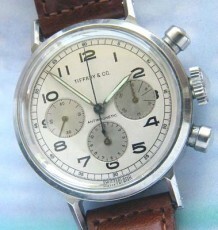 The stainless steel case is in excellent condition and the watch is fitted with a Wittnauer 17 jewel automatic movement. 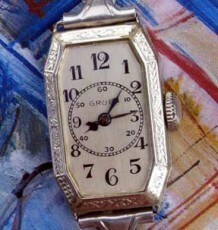 The dial, which depicts the day and date at 3 oclock, is in pristine condition. The watch is supplied on an aftermarket oyster style folded bracelet, as the original leather strap broke down over the 30 years that have elapsed. 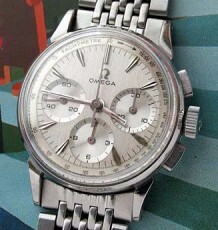 The watch is supplied in the original box and is an affordable curiosity that looks great on the wrist also. 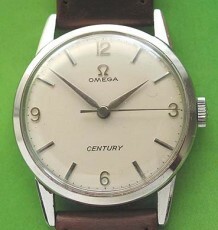 The watch measures 34mm wide by 39mm long.